Isn’t that a gorgeous quilt? Titled African Sunset, it will be auctioned at the African Soiree, this Saturday March 9, 5 to 8 p.m., to benefit the United Front Against Riverblindness (UFAR). Plus everyone who also comes for the whole program (authentic African dancing and drumming, fashion show and sale, international buffet) will take home one of the adorable dolls, shown below. The fourth annual community-wide Soiree will be at the Mackay Campus Center, Princeton Theological Seminary, 64 Mercer Street, Princeton. For $60 tickets ($30 for students) email ufar@princetonumc.org or go to www.riverblindness.org. Free offstreet parking is available. The auction also includes other items, including another beautiful quilt. For questions or to bid on the quilts in absentia, call 609-688-9979. Riverblindness starts with an excruciatingly itchy rash, and when it leads to blindness, children must leave school to be full-time caregivers for family members. About 21 million of the 60 million people there are at risk of getting this socially disruptive disease. There is a drug for riverblindness, provided free by Merck & Co., but it is a challenge to get the drug to remote villages and ensure that every person takes the drug once a year for at least 10 years. I’ll be there, supporting UFAR founder Daniel Shungu. James Floyd, a former Princeton mayor who will celebrate his 91st birthday that evening, will be the guest of honor. 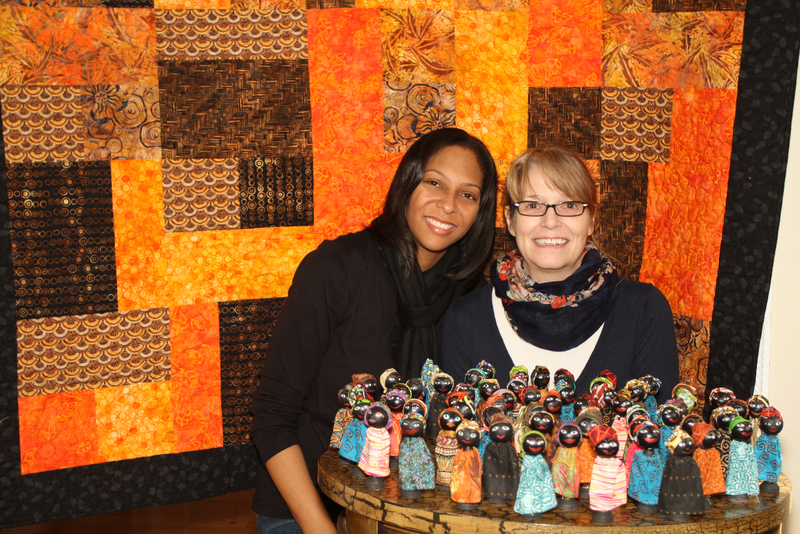 Photo by Robin Birkel: Susan Lidstone (right) shows Dana Hughes the dolls that she and volunteers from the Lebanon Quilting Guild fashioned as favors for the Fourth Annual UFAR African Soiree.on Saturday, March 9, 5 to 8 p.m., at Princeton Theological Seminary. Also shown, a brightly colored African Sunset quilt, made by Shirley Rudd, which will be auctioned at the Soiree.